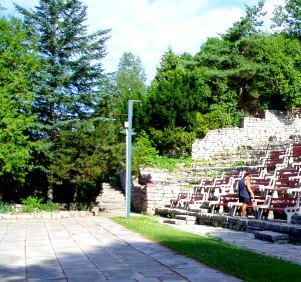 The Saugeen Amphitheater is found on the Saugeen First Nation Indian Reserve just north of Southampton along Hwy 21. 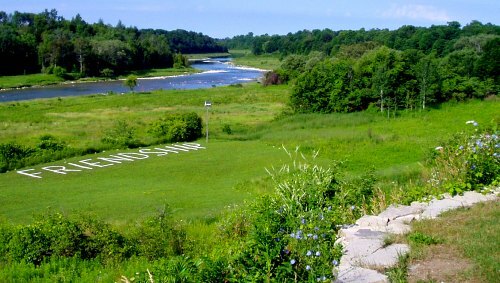 It is a favouite location for outdoor weddings for its lush gardens and picturesque setting along the Saugeen River. Construction started in 1972 and took 10 years to complete. The Friendship sign shows the true spirit of the sight as a collaboration between Native and non Native persons. Just under a million tons of locally quarried Limestone went into building the stone walkways stairs and outdoor amphitheater. It was a project started by Reverend Stotesbury and is now maintained by the Saugeen First Nation Reserve. The Saugeen First Nation Reserve's Wesley United Church continues to hold service at this location. In the Summer months service is held outside in the amphitheater. As such this is a popular location for summer weddings and wedding pictures. Capacity is 200 - 500 depending on your seating choice. In addition to Christian services the Saugeen First Nation uses the Amphitheater for other celebrations and performance related events. 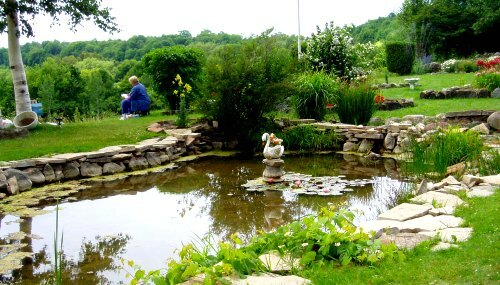 Even if you aren't getting married or visiting for a church service the Saugeen First Nation Amphitheater is worth the visit for the amazing perennial gardens and hiking trails. This is a favourite location for local artists and nature enthusiasts. The location is also historic; home to an ancient burial ground, the site of an ancient battlefield and finally the signing on an Indian treaty. If you want to explore the Saugeen First Nation's Amphitheater head north out of Southampton along Hwy 21. Return HOME from the Saugeen Amphitheater.